A G.I. Joe sequel in 4K. Just what I wanted. Sony's Video Unlimited service is expanding to include 4K movie downloads this fall, solving the problem of distributing Ultra HD content to 4K-capable televisions. "We will be first in the world with a native 4K downloading service," said Sony Electronics President and Chief Operating Officer Molyneux during an event today, as reported by Mashable. These movies will come from Sony Pictures and independent studio catalogues at first, as Video Unlimited begins to include content with four times the resolution early next season. "We're populating that now with 4K feature films, primarily from Sony Pictures, but there are other short-form films from other production houses," Molyneux noted. 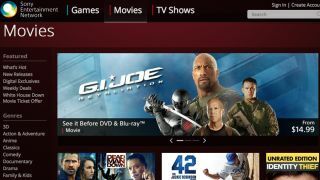 Right now, Sony's Video Unlimited service includes SD, HD, and 3D movie downloads. The addition of movies in 4K, also referred to as Ultra HD by every other TV manufacturer, would finally give the earliest adopters an on-demand source for content. Right now, cutting-edge owners of Sony's UHD TVs can only use the expensive Sony FMP-X1 4K media player with pre-loaded 4K video content to enjoy movies at the maximum resolution. Sony's PS4 console, which will play 4K movies but won't support 4K games, may be preceded by Video Unlimited's 4K movie expansion in early fall. PS4 is on a "different timeline," said Molyneux, according to the Mashable report. Sony has maintained a vague "holiday 2013" launch date for its next-generation console, while Microsoft is scheduled to deliver the 4K-capable Xbox One in November. Even if PS4 misses Video Unlimited's 4K launch, 4K movie buyers should still be able to share their downloads with multiple Sony devices, including the console. The company recently changed its DRM policies so that users can play downloaded content across multiple devices like PS3, PS Vita, and PSP, according to Shacknews. "If you purchase a copy, the video or TV show download will be available infinitely and can be transferred to other enabled devices," reads Sony's new Video Unlimited Terms of Service.